Meet the new face of business intelligence: Tableau Software. Tableau helps people see and understand data. Its award-winning software delivers fast analytics, visualization and rapid-fire business intelligence on data of any size, format, or subject. The result? Anyone can get answers from data quickly, no programming required. From executive dashboards to ad-hoc reports, Tableau lets you share mobile and browser-based, interactive analytics in a few clicks. Over 26,000 companies and organizations rely on Tableau, including the the world’s largest enterprises and governments, mid-size and small businesses, web publishers, schools, and non-profits. Texas Rangers players are known for making smart choices and agile moves on the baseball diamond. And this Major League Baseball team's back-office staff is doing the same—with data. From analyzing ticket sales in near-real-time for optimal staffing to understanding just how all those peanuts, Cracker Jacks, and beer are impacting the bottom line—the Texas Rangers are using Tableau to be as nimble and smart in the back-office as their players are on the field. The Gartner annual report on the Business Intelligence and Analytics market carries special significance becausee it reflects the innovations and changes that are driving the market. An important aspect of this analysis is the Magic Quadrant, which shows the relative position of each competitor in the business analytics space. For the third year in a row, Tableau has been named a Leader in the Magic Quadrant. This year, Gartner placed Tableau highest in ability to execute. The trends that Gartner discusses in the report are familiar. Customers in the Business Intelligence marketplace are demanding products that are easier to use, accessible to everyone, and simple to integrate with existing systems. 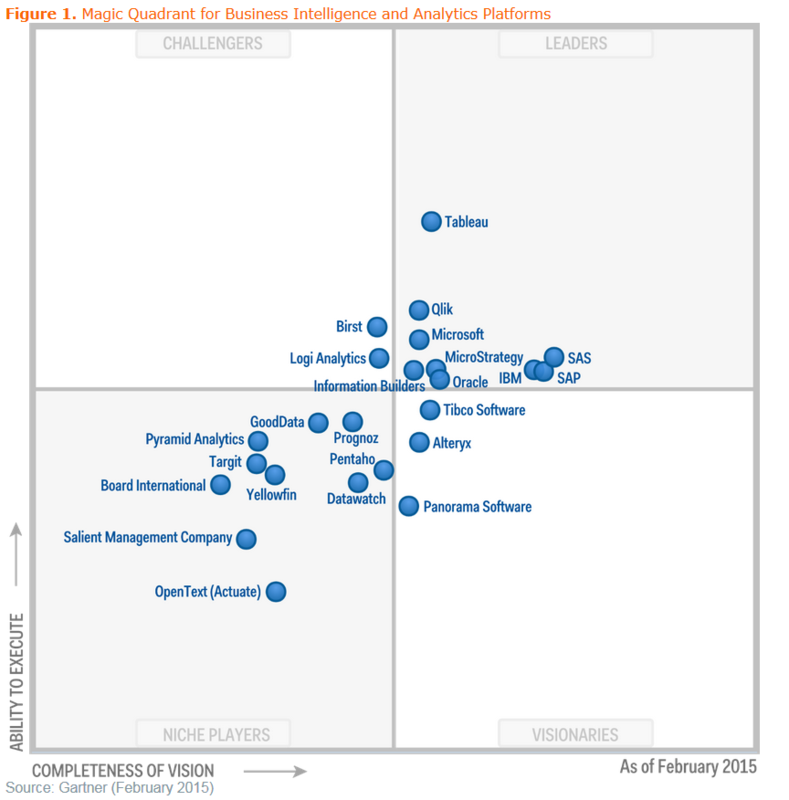 Tableau has eagerly pursued innovations in these areas and Gartner has affirmed its position as a leader for 2015. Innovation doesn’t stop there, Tableau 9 was released during the second quarter of 2015, packed with dozens of new innovations to help people see and understand their data. Think Tableau can be the tool that will drive your business to the next level? Skeptical that it's really as user-friendly as easy as it seem? See the results for yourself.